Darryl hard at work on Napoleon at the Tomb (photo by Jim DeRogatis). Like most great adventures, this one started with an unexpected phone call. Jim DeRogatis rang me a few weeks in advance asking if I already had made my travel arrangements to attend the upcoming MFCA (Miniature Figure Collectors of America) show and sale. I had just made my arrangements, coming in from Canada, but he began to tell me that there were three Sheperd Paine shadowboxes from the collection of the late Andrew Wyeth at the Brandywine River Museum that needed to be restored and rewired to accept LEDs where Shep originally used miniature incandescent auto bulbs for the general lighting and Pacific Fast Mail Order Super Miniature bulbs for the candelabras and candles. These three boxes will be on permanent display in Wyeth’s studio, where he kept them since he purchased them. The studio previously had been closed to the public, but starting this July, it has been opened to admirers of the great painter on tours led from the nearby museum, where his work also is on prominent display. 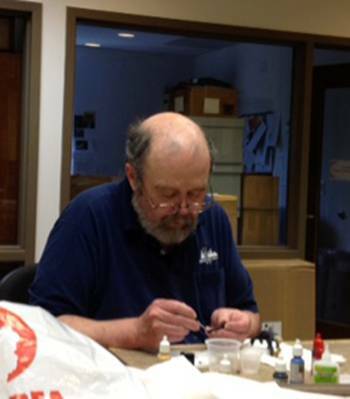 Mike Cobb, an oils enthusiast, makes due on some touch-ups with acrylics (photo by Jim DeRogatis). president Mike Cobb, and I headed over to the Brandywine River Valley once the MFCA show ended. 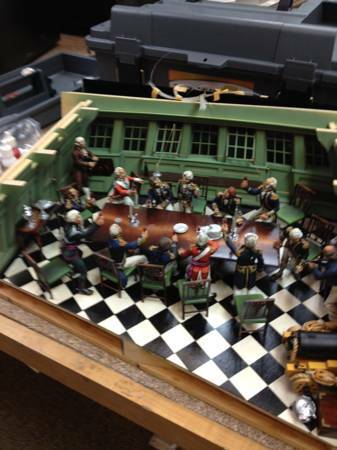 MFCA show chairman Dennis Levy and MMSI member Dan Bird, who now owns another of Shep’s famous boxes, “The Gundeck of the HMS Victory,”) also joined us at times to add their valuable help. 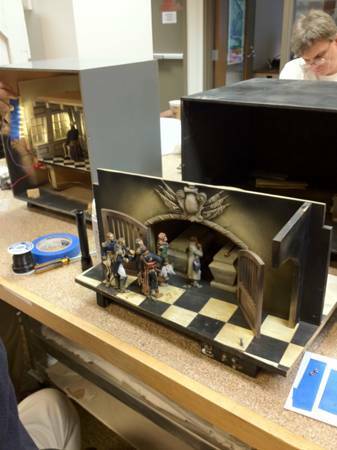 We set up shop and did our work in a back room/work shop at the museum, polishing some of the most legendary pieces in modeling history: “Napoleon at the Tomb of Frederick the Great,” “To a Fair Wind… and Victory!” and “Dr. Syn,” a piece based on one of Wyeth’s paintings and commissioned by his wife as a birthday present. The museum excursion not only was a lifelong opportunity to finally see these magnificent masterpieces in person, as opposed to just in magazines, but to actually work on them under the watch of the greatest miniature artist of our generation. And our team worked closely under Shep’s guidance, learning in such a short period of time years of the master’s modeling effects and techniques. Shep checks out Darryl and Mike’s work (photo by Dan Bird). Jim soldering the connections to the LEDs in Dr. Syn (photo by Dan Bird). Dr. Syn rewired for the 21st Century (photo by Jim DeRogatis). Jim had the challenging work of removing all the inner scenes’ primary light bulbs and replacing the old auto bulbs with LEDs he secured from EvansDesign. Thankfully they could run on the existing 12volt transformers installed in all of the boxes by Shep years ago. Meanwhile, Mike set out to match and touch up all of the areas of faded paint (Shep’s blue oils had aged particularly poorly), as well as repairing small areas of a few figures and accessories that suffered minor damage when they had come loose or fallen over. The inner scene of Napoleon at the Tomb. velvet-covered reveals and outer frames to be reinstalled. And the job was done! We took one last look at these masterpieces before collecting up our tools and supplies, departing the museum, and heading to the Philadelphia airport for our flights home. The ride back was rather quiet as we all realized what we’d done: Immortalizing three of Shep Paine’s most famous shadowboxes for future generations of modelers and art lovers to enjoy. 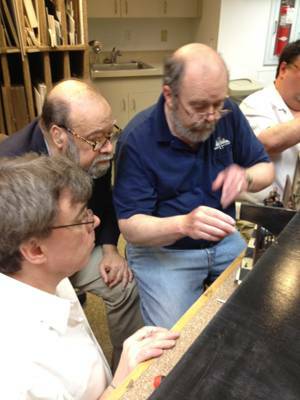 The Brandywine Restoration Group: From left, Shep Paine, Jim DeRogatis, Darryl Audette, Mike Cobb.N.B. The three dioramas now are on display as part of a special tour of the Wyeth workshop at the Brandywine River Museum in Pennsylvania (also on display there: Barracoon, which was not a part of our restoration efforts). These currently are the only Paine boxes on public display.